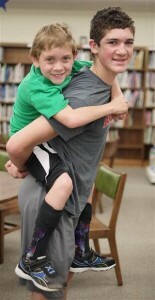 Michigan teen Hunter Gandee, 14, who is on a crusade to raise awareness about cerebral palsy by carrying his 7-year-old brother, who has the disorder, for 40 miles. Hunter, has been hoisting Braden onto his back for as long as he can remember, carrying him to beaches, up and down mountains, and often just through their local grocery store. Captain of his wrestling team, Hunter says he’s nervous about taking this longer trek with Braden. And yet, watching Braden struggle valiantly to negotiate everyday tasks is Hunter’s inspiration. Cerebral palsy includes several neurological disorders appearing in infancy or early childhood that permanently affect body movement and muscle coordination, according to the NIH’s National Institute of Neurological Disorders and Stroke. Braden’s cerebral palsy makes it a struggle for him to walk and sometimes, to speak, the first-grader said. He uses a walker, and it doesn’t always work well on the mulch in his school playground or at the beach. While Hunter lifts weights and his brother as much as possible to prepare for their long walk, Braden said he’s also training, trying to loosen up as much as he can. They have dubbed their walk “The Cerebral Palsy Swagger” and are gathering support on Facebook, Twitter, and their blog. The pair will set off on June 7 at 8 a.m. from the wrestling room at Bedford Junior High School in Temperance, MI, where Hunter is a student. Their parents, Danielle and Sam Grandee, will drive ahead of them, and a slew of volunteers are expected to accompany the boys on their journey. They’ll stop overnight in the town of Milan and plan to arrive at about 2 p.m. on June 8 at the Bahna Wrestling Center at the University of Michigan, in Ann Arbor. In March, Hunter raised $350 for the Cerebral Palsy Research Consortium of Michigan, selling green cerebral palsy awareness wristbands for a dollar each at school. During this walk, the boys want to raise awareness rather than donations. Both boys hope one day to study biomedical engineering so they can design mobility equipment. Their mom, Danielle Gandee, said she’s confident they’ll succeed in whatever they attempt. Just like his older brother, Braden is an A student with lots of friends.